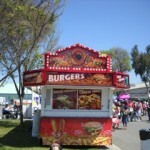 Peter and I recently ventured to cover the 2011 America’s Family Pet Expo, in Costa Mesa California. 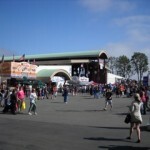 We went partly out of curiosity, wanting to see what of interest to animal rights oriented people would be there. Of course, we also have pets so we are somewhat interested in the pet scene, though pets are not the main focus of the radio show. But maybe we’d find something worthwhile to report. 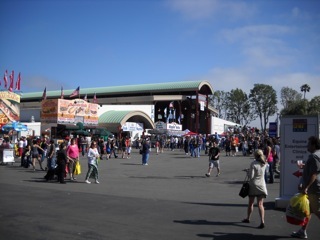 The event is truly huge, filling many large buildings, spilling out onto the expansive OC fairgrounds. Visiting the show is an ideal excursion for pet people, families with children, people interested in adopting a pet, those curious about new and novel pet products, and folks wanting to see animal performances like dogs leaping into tanks of water. 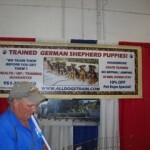 Our visit got off to a rocky start, when we came across a large booth of Greman Shepherd breeders/trainers. The breeding of dogs is so antithetical to our philosophy (including that breeders are largely responsible for much of the pet overpopulation problem and hence the high euthanasia rate in our shelters), we had to restrain ourselves from confronting them. 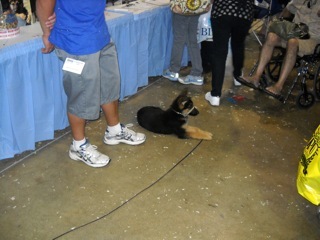 Their training expertise was on display by having a puppy lying on the ground, surrounded by the noisy crowd. Puppy as sales tool. By the way, we would be interested in readers’ take on this issue. Is responsible breeding possible, as those over at Best Friends Animal Society believe, or is all dog and cat breeding irresponsible, which is our position? A few steps away we came across some cute non-leather dog and cat collars on display. We are not publishing pictures of them, however, because we were literally chased down by a very protective, diminutive, foul-mouthed salesperson who demanded we hand over the camera so she could erase the photos of her employer’s collars. Well, following our German Shepherd encounter, we were in no mood to erase any pictures the ranting salewoman claimed were obtained illegally (untrue) or later, in violation of the rules (also wrong). But take my word, there are cute vegan dog and cat collars; we’re just not saying who’s got them. Unfortunately, at this show they were way outnumbered by the leather type. We walked on, took a few breaths, let out blood pressure normalize, and enjoyed the delightful Southern California breeze. 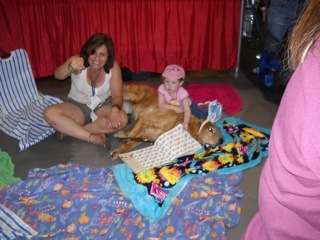 A booth with a young child on the ground with a large dog caught our attention. We had discovered BARK, Beach Animals Reading with Kids. 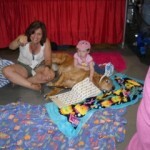 Apparently, when kids are learning to read aloud, doing so with a dog nearby improves their progress. Take a look at BARK, it looks like the idea is catching on. 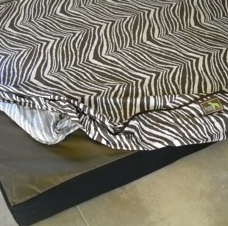 Southwest Wildlife Foundation, please vist them here. We met a nice trio of guys from Arm the Animals, a new shirt business, with an animal rights edge to their designs. They support local animal welfare nonprofits, and thus, their tagline: Saving lives one shirt at a time. They gave us two of these cool shirts, thanks guys. with a variety of unusual and stylish cat trees. 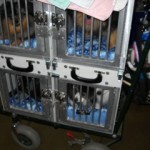 Pet Pals is located in Industry, CA, and here is their website. On the negative side, were the animal breeders. 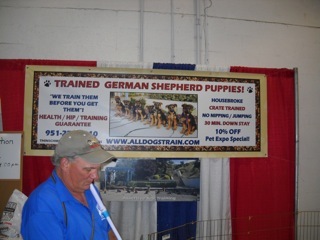 Although the Pet Expo’s rules prohibit the sale of animals, breeders of animals abounded, and clearly, deals to be completed later were being struck. 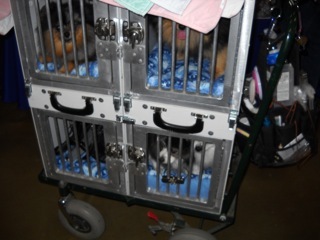 The owner of this mobile kennel/transport, when we asked her if she was with a rescue group, said something like, “If you breed, you have to rescue”. We think it would be better for her to do neither, and find another line of work. And then there was the food. 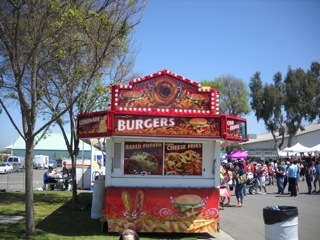 Not much for the vegan crowd, this picture of a snack stand is representative. There was cotton candy and pretzels, but not much more. However, we planned ahead and ate beforehand at the nearby Whole Foods. Finally, we must mention all the animal rescue groups present, probably in the hundreds and representing multiple breeds and species. We were told that more than 800 dogs and cats were adopted to families because of this year’s show. That’s just great! So, overall, it was a worthwhile adventure for a pair of pet loving, vegan, animal activists. And yes, we would recommend the show to families (despite the prevalence of animal barter evident) because there is much on the positive side going on there. To browse our archived shows, click here.